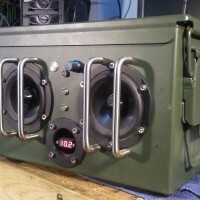 50 Caliber Ammo Can Speaker Box powered with 50 watts of sound. For simplicity and compatibility reasons i decided to use all Dayton Audio parts and pieces where possible. Rugged, powerful and good looking…no, that’s not my Tinder profile heading but rather the 3 main points i wanted to incorporate into this project. The enclosure needed to be able to withstand some mildly abusive handling while still maintaining structural integrity. Camping trips, late hours in the shop and kicking around the job site and in the work van are all within it’s job description and than some. Seeing how this box was going to be used outdoors and most of the time in noisy environments it need to have plenty of power and some punchy powerful bass, especially for its small size. Not only did i want the outside to look good but also the insides as well. Since it has a removable lid that can be opened fairly easily i wanted the internal workings to be just as visually appealing. A 50 Cal. ammo can is about as indestructible an enclosure i could find and it was just about the smallest size that i could comfortably use to house all the components. 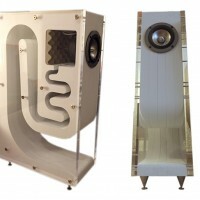 The only modifications needed to be done were the drilling of holes to accommodate the drivers, LED’s, power and volume, DC input, BT antenna and the bass port. 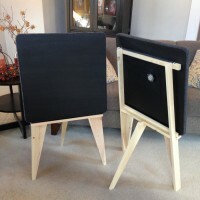 I started by lining the four sides and bottom of the steel can with 1/2″ MDF to not only deaden its sound but also to have something to attach all the components to without using either hot glue or external screws. 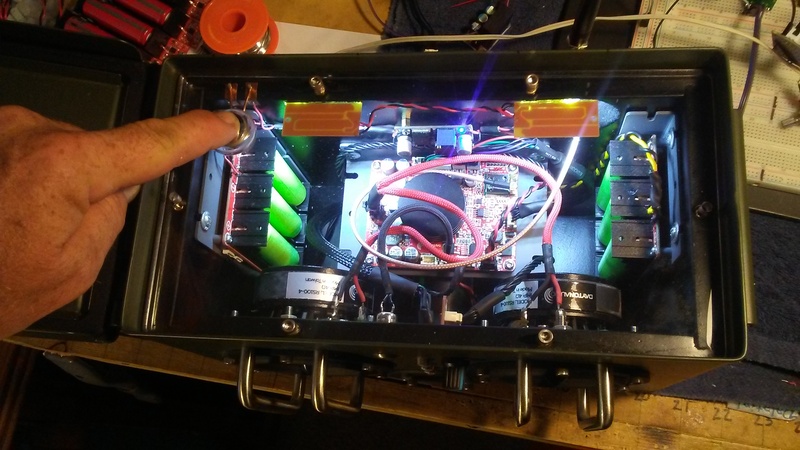 The drivers were the first to be bolted in followed by the bass port which also houses a volt meter for the battery boards. Next up were the battery boards and than finally the star of the show, the Dayton Audio KAB250. Everything was wired up using the harnesses that came with KAB board however i did make custom sleeves from para-cord and heat-shrink tubes to give the wiring a cleaner more dressed up look. 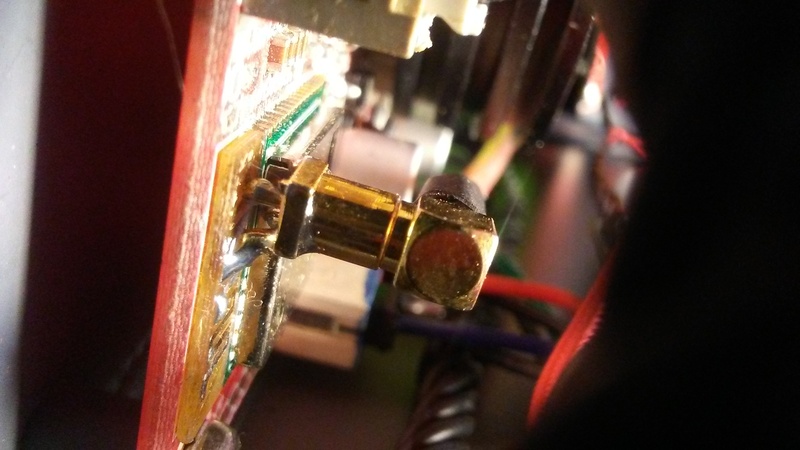 I was concerned that the metal box would interfere with the BT signal and since this was an older version of the KAB without the external BT antenna socket I decided to make one modification to the KAB board by drilling a 0.8mm hole in the BT trace and solder in a MMCX connector to attach an external antenna. BT range is now about 100′. Since the can’s lid is operable and i plan on showing off the insides i decided to install a second interior lid made from 3/8″ cast acrylic to protect everything inside. Mounted in the Acrylic is a momentary button to power two LED modules that are facing inwards to illuminate the circuity. 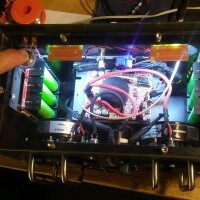 Powering them was accomplished by tapping off the 12 volt supply and bucking down to 5 volts. 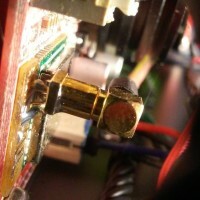 The LED’s are mounted to the side of the box while the power button is mounted in the removable lib. Making two contact points with copper tape and wire between the bottom side of the lid and top edge of the box i am able to switch the LED’s on and off while the lid is in place and also able to remove the lid and not have any interconnected wires to disconnect if i need to access it. I laid out all the holes for the front panel on a sheet of paper and once i was satisfied with it i used spray glue to attach it to the box and it made drilling everything much easier knowing that there would be no mistakes. Rugged, Powerful and good looking…check, check and check. 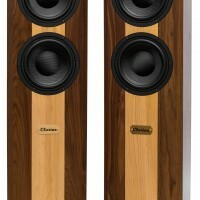 The sound is clear and very strong and the drivers provide plenty of low frequencies. The double battery boards provide plenty of high volume play time (more than 10 hours) and the BT range makes it work just about anywhere i use it. There are a few things i would do differently next time. 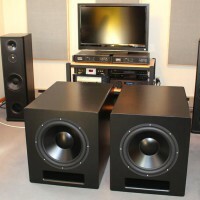 Add a baffle step correction circuit to even out the levels with the full range drivers. Add audio input and USB expansion board. Wire up the volt meter to the main power switch so that it only lights up when device is being used. Otherwise it slowly drains the batteries. 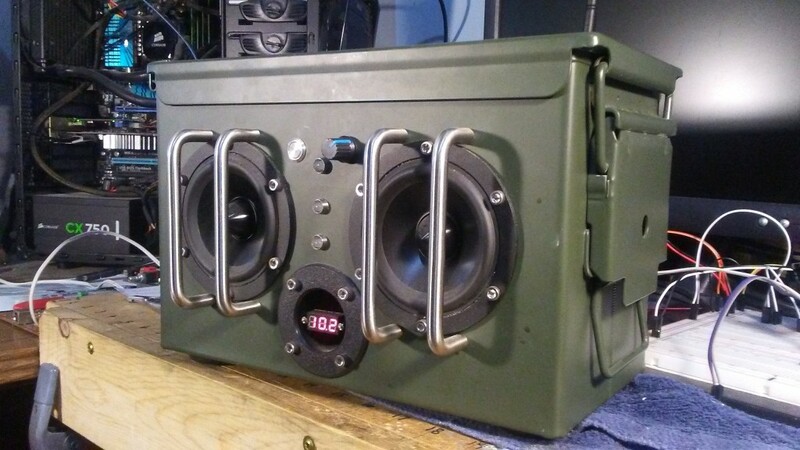 Overall Im pleased with my first attempt in building a portable speaker box. I think ill build another one. Any ideas? 48 year old carpenter/cabinet maker/tinkerer/music lover. 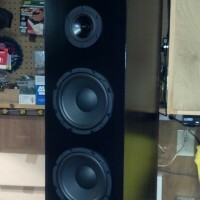 I love building stuff. Be it a huge custom house or a humble little wooden keepsake box. Throw in some electronics or anything that plays music and i’m a happy guy.